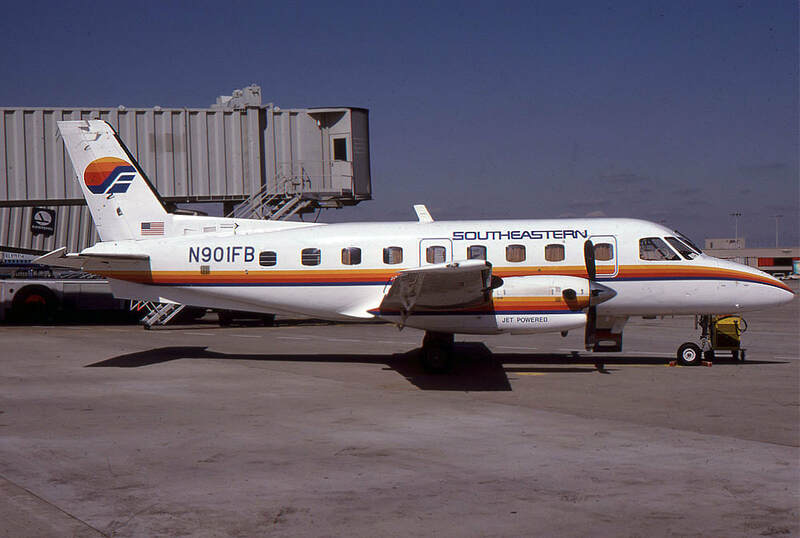 Southeastern was originally known as Coastal Air and began service in 1975 with flights between Atlanta and Auburn, AL. 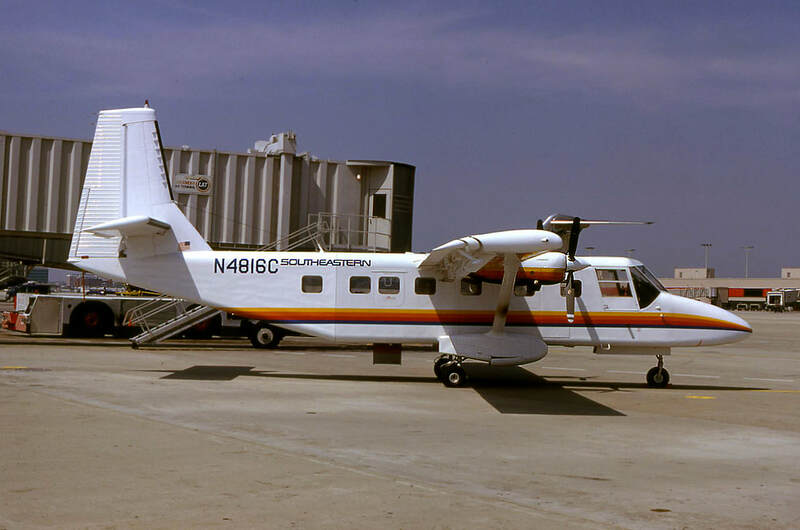 The airline became Southeastern Commuter in 1976 and, over the course of the next few years, expanded into small niche markets from Atlanta including flights to Tuskegee, AL and LaGrange, Callaway Gardens and Rome,GA. 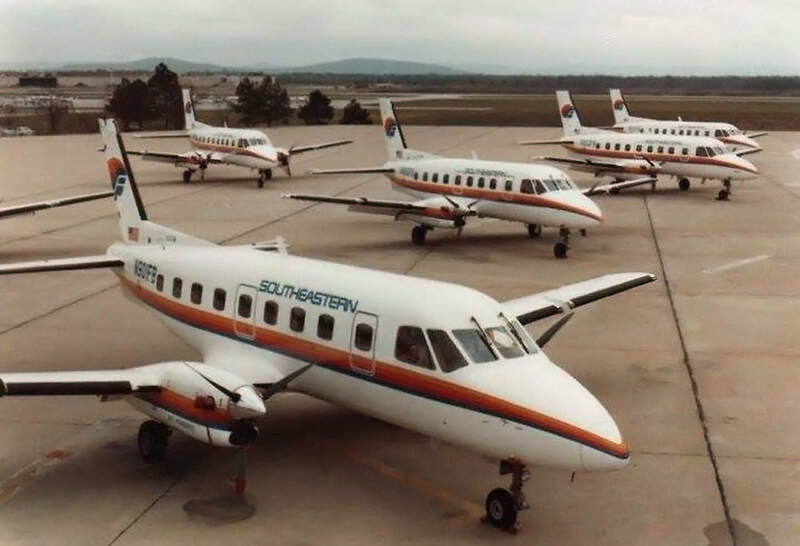 Southeastern grew to become the 2nd largest commuter airline at Atlanta in the early 1980s and, after accumulating sizable debt following rapid expansion, merged with Atlantic Southeast (ASA) on April 1, 1983. Southeastern Commuter initially operated de Havilland DH-104 Doves converted by Riley Aeronautics. The Riley Doves had been refitted with Lycoming engines and the later models had a tall swept tail. 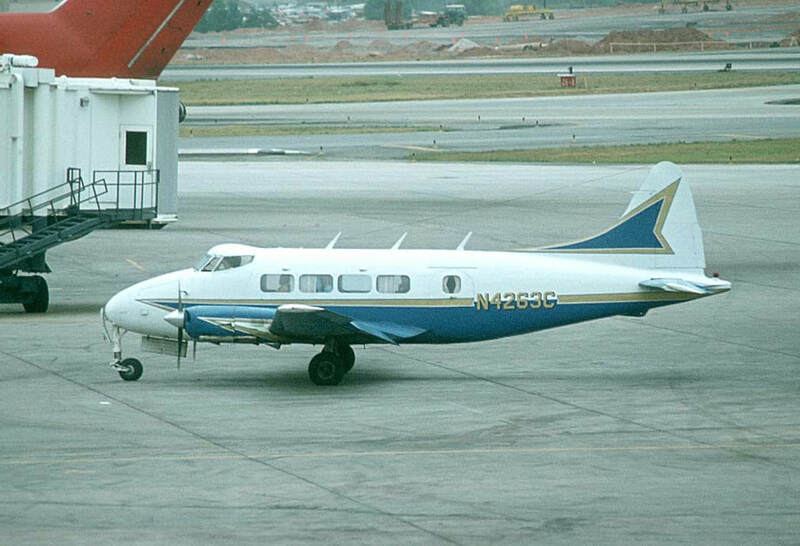 N4263C, with the original tail design, is pictured at the old Atlanta terminal on July 1, 1978. Photo copyright Mick Bajcar. A Southeastern Commuter Airlines route map based on the January 15, 1977 timetable. Riley Dove N808RH, with the redesigned streamlined tail, is pictured at Atlanta's ground-level commuter gate C2 circa 1982. By 1982, Southeastern Commuter was known simply as Southeastern and had undertaken a massive expansion including the addition of Embraer Bandeirantes. "Bandit" N901 FB is seen at Atlanta in 1982. 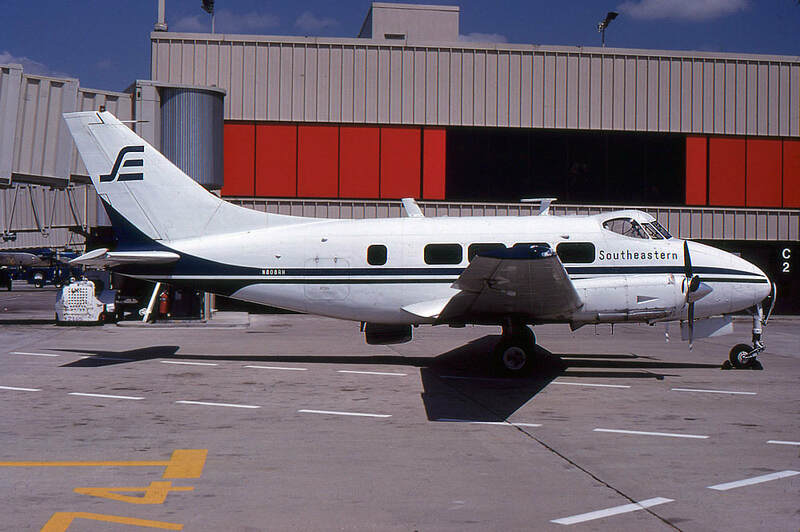 Southeastern was one of few U.S. airlines to fly the 16-passenger Australian-built GAF Nomad. N4816C is pictured at Atlanta in 1982. 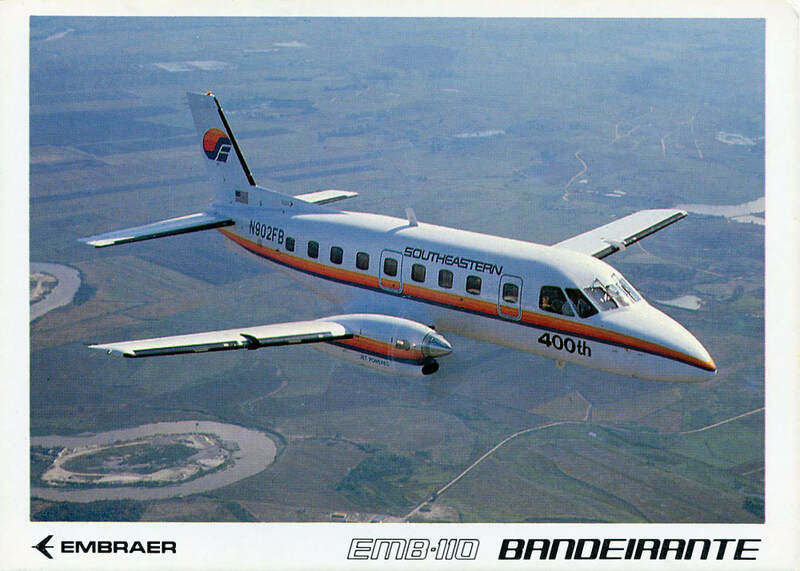 A great 1983 air-to-air postcard showing Southeastern's N902FB, which also happened to be the 400th Bandeirante delivered by Embraer. A rare view of Southeastern's entire Bandeirante fleet, taken on Christmas Day 1982. Photo sent in by Faron Blalock. Route map based on the February 15, 1983 timetable shows the dozen destinations served by Southeastern shortly before it was absorbed by Atlantic Southeast Airlines. Nearly all of these routes were formerly flown by Southern Airways (with the notable exception of Auburn) and had been abandoned after Southern became Republic Airlines. Map generated by the Great Circle Mapper - copyright © Karl L. Swartz. "As students at Auburn in the 70's, a good friend and I formed a small (tiny) ad agency and Southeastern was one of our clients. You wouldn't believe the ads they had running in the newspaper--they were hilarious. We tried to "upgrade" them a bit and added a series of radio spots complete with girls from the Auburn Chorale singing, "Fly Southeasternnnnnnnn," at the close of each spot. We dealt with a management team whose names were Roy and Dale. Very nice folks. In addition to paying us for our work we were allowed to fly anywhere on the planes, space-available. That made for some really impressed dates." In July 2016, Karen McKay wrote: "I was a former Atlanta-based Delta Stewardess who later became the station manager for Southeastern in Rome, GA. When the Rome base closed, I worked with the airline at the ATL airport. I loved that job and did everything: wrote the tickets, greeted the incoming passengers, placed & removed the chocks, loaded & unloaded the baggage, waved the flight in and out. I did everything but fly the plane! Roy & Dale were business partners and good friends. Dale had a couple of sons who were young teenagers back then. When I worked at Rome, occasionally I would have to fly in the Dove to ATL and back to add ballast. Sometimes my 4 year old daughter came along. Some of the pilots' names I remember are: Mike White, "something" Schrier, who left to go to Africa for mission flying. We called him "Friar Schrier. There was Jordan (something) & we called him "JJ." There were two others whose names escape me now. I left Southeast when it was taken over by Atlantic Southeast. The whole "family feel" was gone. I have some memorabilia from the airline: A "Nomad" pin, an Embraer Banderante medallion, a photo of the Dove, a timetable and a pen."